Illuminating Wheels- Our Waveboard has a new feature, Illuminating Wheels, that will make the rider safer by being more visible. 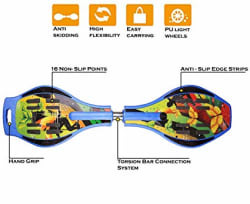 Both wheels will light up as you ride on the board. The faster you go the brighter the lights will become! So let s keep moving!